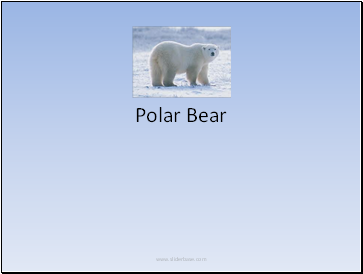 Polar bears live only in Arctic areas that surround the North Pole—not in Antarctica, which surrounds the South Pole. School children often see illustrations of penguins and polar bears together, but this could never happen. 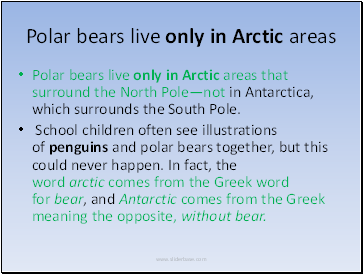 In fact, the word arctic comes from the Greek word for bear, and Antarctic comes from the Greek meaning the opposite, without bear. 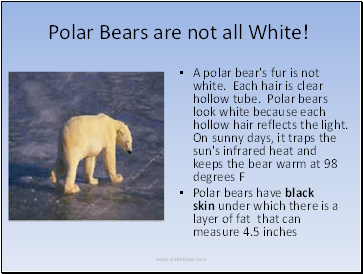 Polar Bears are not all White! 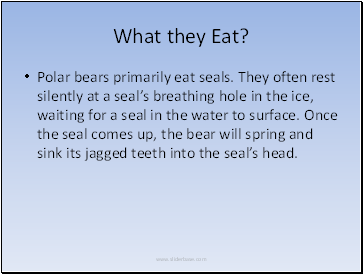 Polar bears primarily eat seals. They often rest silently at a seal’s breathing hole in the ice, waiting for a seal in the water to surface. Once the seal comes up, the bear will spring and sink its jagged teeth into the seal’s head. 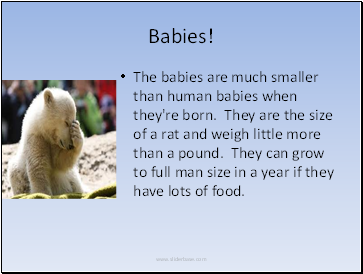 The babies are much smaller than human babies when they're born. They are the size of a rat and weigh little more than a pound. They can grow to full man size in a year if they have lots of food.